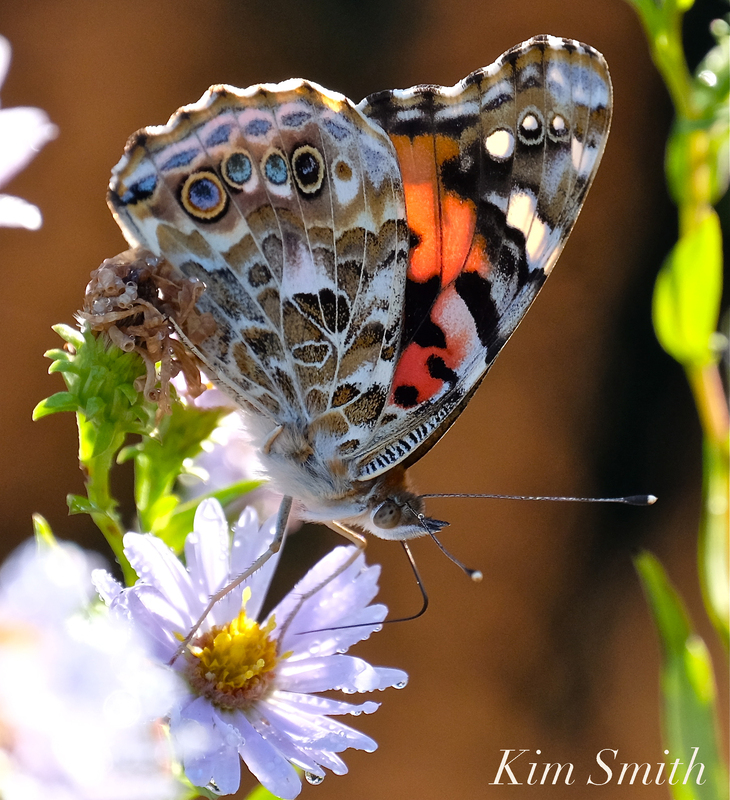 A SPECTACULAR PAINTED LADY BUTTERFLY IRRUPTION HAPPENING RIGHT NOW! 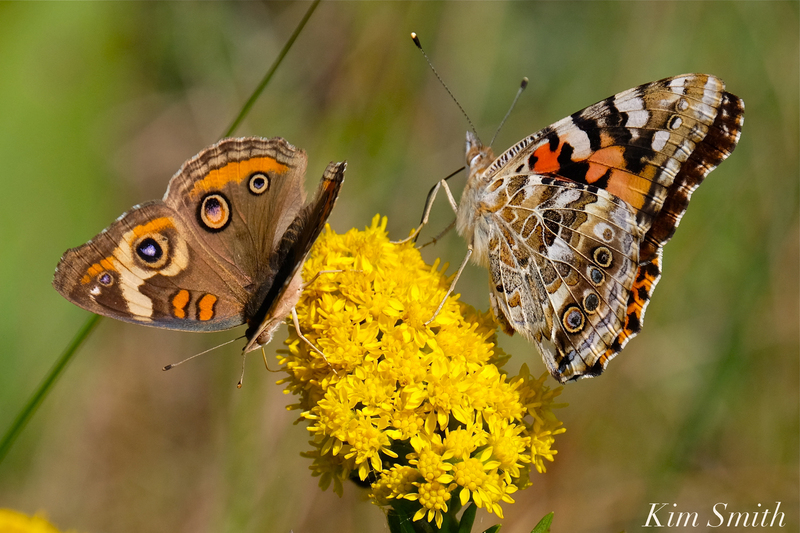 The sheer number of Painted Ladies migrating are stealing some of the Monarchs thunder! Many readers have written inquiring about the beautiful butterflies with wings in a tapestry of brilliant orange, brown, black, gold, and blue. 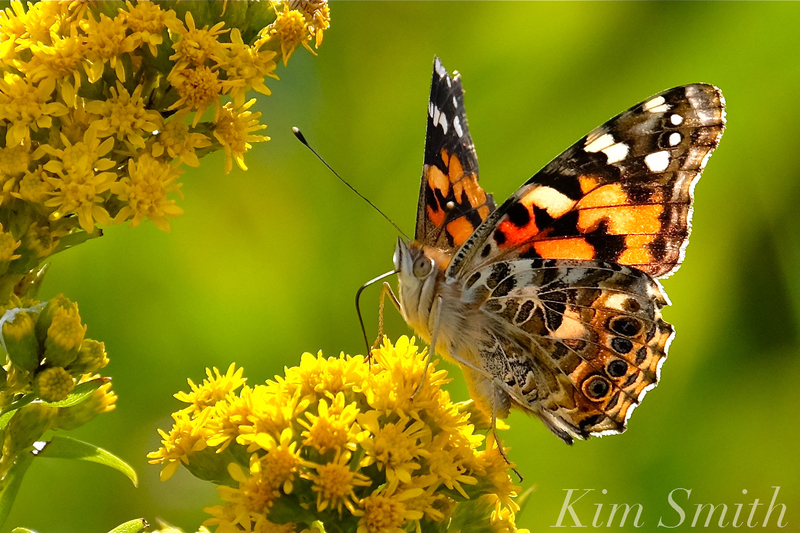 Painted Ladies (Vanessa cardui) are often confused with Monarch butterflies, especially during the late summer. 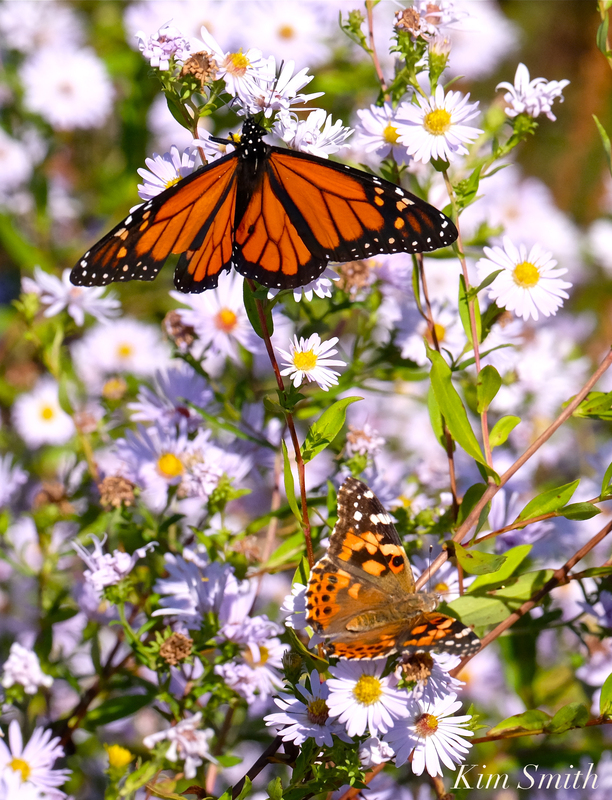 Both are currently migrating and you will often see the two species drinking nectar side-by-side. 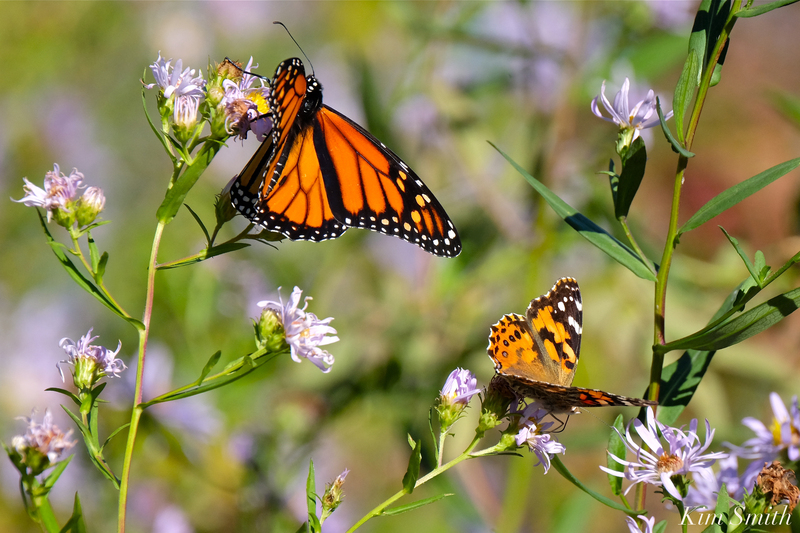 As do Monarchs, Painted Ladies depart from Mexico to begin their northward migration in springtime. Both Monarchs and Painted Ladies belong to the brush-foot family (Nymphalidae) and can only survive in warm climates. Monarch Butterfly, top, and Painted Lady bottom. Note that the Painted Lady is about half the size of the Monarch. Sightings from the midwest recorded large numbers early in the season, and 2017 has proven to be an outstanding year for this most successful of butterflies. The Painted Lady is also nicknamed the “Cosmopolitan” butterfly because it is the most widespread butterfly in the world. One reason we may possibly be experiencing a Painted Lady irruption in North America is because a rainy spring in the south was followed by a fabulous bloom of dessert annuals that provided abundant food plants for the caterpillars. Unlike Monarch butterflies, which will only deposit their eggs on members of the milkweed family (Asclepias), Painted Lady caterpillars eat a wide range of plants. More than 300 host plants have been noted; favorites include thistles, yarrow, Pearly Everlasting, Common Sunflower (Asteraceae), Hollyhock and many mallows (Malvaceae), various legumes (Fabaceae) along with members of Boraginaceae, Plantaginaceae, and Urticaceae. 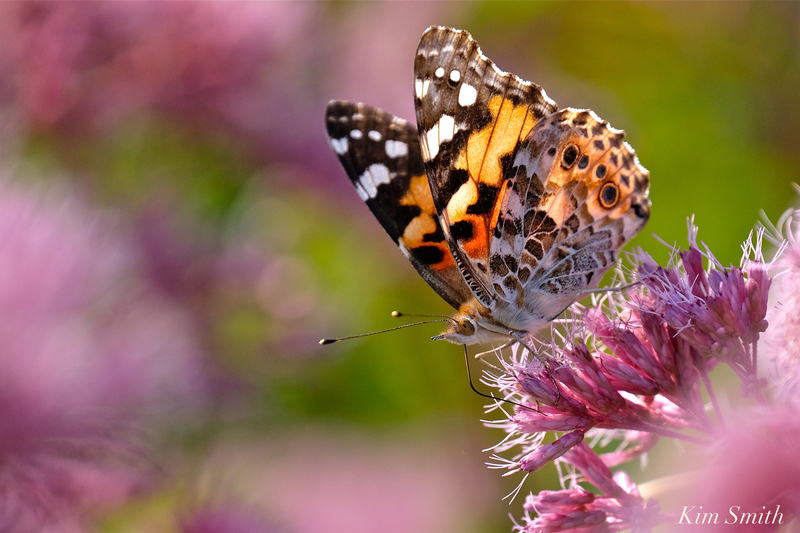 Much, much more remains to be discovered about the beautiful Painted Lady, its habits and how their behavior and seasonal distribution varies by geographic location. This entry was posted in Gloucester Massachusetts, Monarch Butterfly and tagged Cape Ann, Common Buckeye, Gloucester, Joe-pye, Junonia coenia, Monarch butterfly, Native Plants, native plants for butterflies, Painted lady, Painted Lady Irruption 2017, Painted Lady migraton, Purple-stemmed Aster, Seaside Goldenrod, Vanessa cardui, Wildflowers on October 4, 2017 by Kim Smith.